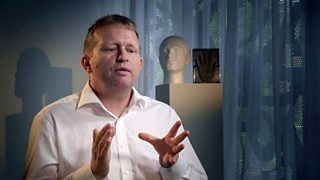 BBC Two - Trust Me, I'm a Doctor, Series 5, Episode 1 - Should I try... acupuncture? In March 2016, the National Institute For Clinical Excellence (NICE) issued new draft guidelines which, if published, will no longer recommend acupuncture as a treatment for lower back pain due to a lack of evidence. However acupuncture is still recommended for the treatment of migraine and tension headaches. So what is the evidence for its effectiveness? Acupuncture is commonly used to treat pain of all kinds, so Michael wanted to experience for himself whether acupuncture could boost his pain threshold in the area in the part of the body where the needles are inserted. This could be part of the explanation of why some people feel the benefit of acupuncture. Before the acupuncture begins, Professor David Walsh, a Professor of Rheumatology and specialist in the management of chronic pain from the University of Nottingham, first administered a pain threshold test at several points on Michael’s body. David then measured whether Michael’s pain threshold changed between each bout of acupuncture. Acupuncture with sham needles. These are needles that don’t puncture the skin and serve as a placebo. Acupuncture with needles as expected. Electro acupuncture. Two electrodes are attached and a small electric current is passed between them. The idea is to stimulate more nerve fibres than conventional acupuncture to further alleviate pain. Relative to the control, Michael’s pain threshold rose after all three of sham acupuncture, normal acupuncture and electro acupuncture. This could mean a number of things: that the “sham” acupuncture is not a true sham and that there are some benefits from sham alone, that acupuncture is just a placebo effect, or, his pain threshold could have been rising with time or repeated testing and have nothing to do with any of the treatments. So after years of trials to find out — what is the scientific consensus? Asbjørn has spent years looking at the several thousand trials done on acupuncture. While there have been many trials done with acupuncture, most of them are small pilot studies and large scale high quality trials are rare. Some studies have reported measurable effects, but the mechanism is not yet understood, the size of the effect is small and it is possible that a large part of the effect or all of the effect is placebo. He thinks it’s obvious that you would see a physiological effect when you stick a needle into your body, the question is whether that has a measurable clinical effect. There is insufficient evidence to say that electro acupuncture is any more or any less effective. The evidence is not there that acupuncture has a measurable, consistent effect – however it may be worth trying for chronic headaches where there is some evidence to show that it is effective.